And that was it. Throw out a morsel to whet the information appetite but give no meat. The usual superficial ‘reporting’ by a US news source. “1%” is not much of a change. Come to think of it, wasn’t Spirit Airlines the airline rated lowest customer satisfaction for 5 years in a row, so what’s behind that double digit growth? Thinking we have missed out on some trend somewhere on airlines expanding, we googled the news under variations of ‘airlines’ and ‘jobs’ and found nothing to support ABC’s headline. We did find CBS DFW which had a different take on the same situation. Their headline was “Employment Up Slightly At U.S. Airlines“. 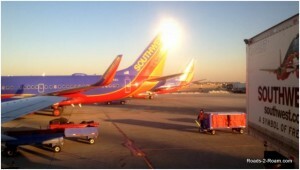 “Dallas-based Southwest Airlines and its AirTran Airways subsidiary shrank by 1.4 percent.”Asociated Press. The model here is that AP puts out the articles to it’s members and the distributed media companies publish it with a tweak here and there. No need to employ an actual reporter. It looks like you have big coverage when in reality, you’ve outsourced your ‘news’. The model here is that AP puts out the articles to it’s members and the distributed media companies publish it with a tweak here and there. No need to employ an actual reporter. It looks like you have big coverage when in reality, you’ve outsourced your ‘news’. So let’s look at Southwest / AirTran part and cutting jobs. Seems to be that this is fallout after the acquisition at the expense of the Atlanta hub where it has cut back AirTran routes . This is also interesting in that Atlanta airport is Delta’s main hub and that Delta appears to have picked some of AirTran’s business. A net wash perhaps then for Atlanta (but not if you were part of the AirTran layoff). Don’t know if there is more story to this ‘story’ but the discerning thing to this all is the AP News-lite model. If your source was ABC, then you could go away thinking airlines are booming again. If your source was the CBS, it was more a ‘Meh’. It seems that it is not just passengers who are missing their connections.